Scene setting: Karl Lagerfeld took his audience on a space odyssey for A/W 2017, with an interstellar set at the Grand Palais. Last season, the designer created a data centre teeming with colourful cables, and for A/W 2017, he erected an almost-fully functioning space station. 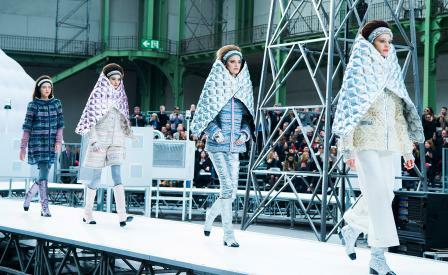 Models took off down a catwalk that weaved between flashing transmission towers, an igloo-like tent and a giant Chanel logo rocket. At the climax of the show, the thrusters of the rocket emitted sparks, smoke and flame, appearing to blast off out of the glass ceiling of the Grand Palais, as a Michel Gaubert remixed soundtrack boomed Elton John’s Rocket Man. Mood board: Chanel’s space cadets sported tweed suits in a variety of interstellar metallic hues, silver leather and shearling jackets and starry embellished blazers and dresses. X-ray scanned astronauts and eclipses in various stages were imagined as prints, and space suit shapes were echoed in elegant playsuits, with curved white collars calling out for a Chanel houndstooth helmet. Finishing touches: Lagerfeld always astounds with his accessories offering, and for his interplanetary A/W 2017 designs, there were glittering silver go-go boots, beaded knitted headbands and tights glimmering with space dust. Chanel’s signature quilting took on new levels of high-performance, in padded wraps in metallic silver and lilac, while hard-case bags were imagined in the shapes of rockets or ringed planets.